This paper deals with the extremely fascinating area of “fusing” the outputs of sensors without any knowledge of the ground truth. In an earlier paper, the present authors had recently pioneered a solution, by mapping it onto the fascinating paradox of trying to identify stochastic liars without any additional information about the truth. Even though that work was significant, it was constrained by the model in which we are living in a world where “the truth prevails over lying”. 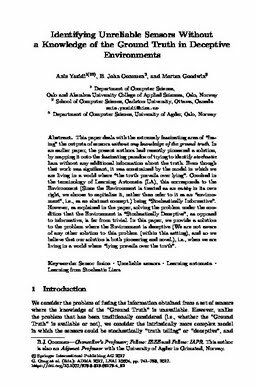 Couched in the terminology of Learning Automata (LA), this corresponds to the Environment (Since the Environment is treated as an entity in its own right, we choose to capitalize it, rather than refer to it as an “environment”, i.e., as an abstract concept.) being “Stochastically Informative”. However, as explained in the paper, solving the problem under the condition that the Environment is “Stochastically Decepti”, as opposed to informative, is far from trivial. In this paper, we provide a solution to the problem where the Environment is deceptive (We are not aware of any other solution to this problem (within this setting), and so we believe that our solution is both pioneering and novel. ), i.e., when we are living in a world where “lying prevails over the truth”.